Sine 1994, the Jacobs Center has been developing relationships with residents and working to design and implement strategies that produce lasting physical, social, cultural, and economic change. In 2013, we began developing the Jacobs Center Learning Series to look back at some of the key strategies we have used in our work, and to look forward to those that will take us through our planned sunset in 2030. We look forward to continuing to share our reflections and learnings. 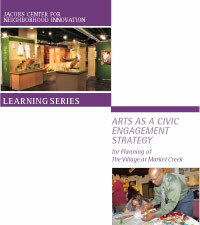 Support for the Jacobs Center Learning Series was provided by a grant from the Annie E. Casey Foundation. In the past, as part of our commitment to hire locally, we set ambitious goals for the percentage of contracts awarded to local construction businesses. This report details a different approach that was used to reach this goal – the development of the Construction Working Team and the lessons learned during this experience. This Team was made up of local community members and construction industry veterans. 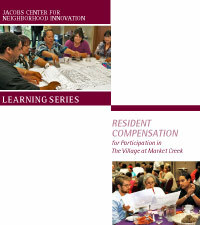 Our work has included carefully considered instances where residents are compensated for their participation. 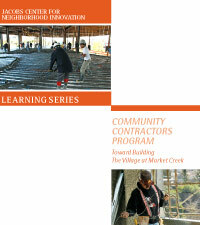 This report outlines three such cases – the Neighborhood Coordinators Training Program, the Construction Working Team, and VOCAL – and looks at some of the benefits, challenges, and learnings from this strategy. While our initial outreach and organizing strategy wasn’t developed with an arts and culture component in mind, it soon became clear that we were most successful at engaging residents and building stronger more cohesive relationships when we led with activities and dialogue around the community’s many cultures. This report looks at the arts and culture-based engagement goals and strategic pathways that resulted from our early experiences, as well as our learnings and next steps. Read up on emerging leaders in our community.